If you've ever had a job interview, you know that one of the most popular questions employers like to ask is "how do you respond to stressful situations?" 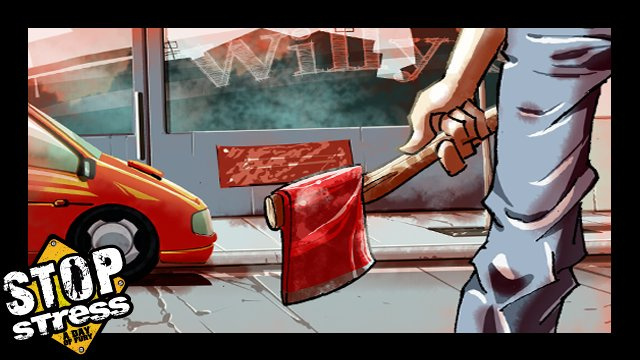 Odds are good if you answered "run amok with an axe until everything in the entire building was destroyed!" you probably wouldn't get the job; even more likely you wouldn't be free to walk the streets to even sit the interview! 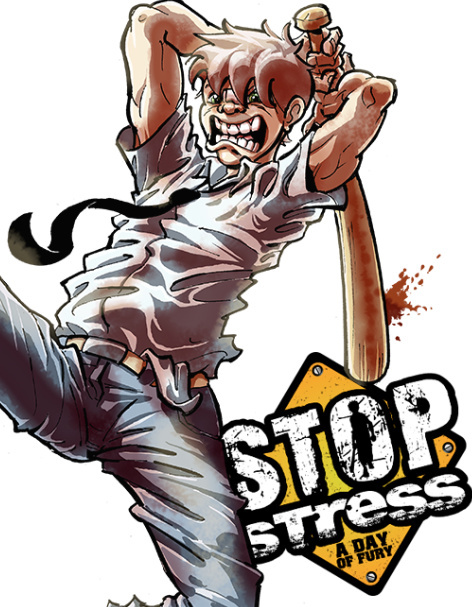 Nevertheless, this is your mission in Stop Stress: to guide a crazy person through various levels and destroy as much of the game world as you possibly can. There are four stages on offer following the "most stressed man in the world" through what is presumably a typical day. He's enjoying a dream of being on a tropical island surrounded by beautiful women in bikinis only to be rudely awakened by the sound of babies crying, doors slamming and alarm clocks. Naturally being the most stressed-out man in the universe our hero smashes his own flat to bits and then proceeds on a rampage through a traffic jam, to his office and then to the airport to flee to the tropical paradise of his dreams. 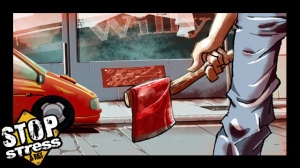 On the way he accumulates an assortment of weapons, starting out with a simple house slipper before moving on to include a baseball bat, sledgehammer, bag of rubble and finally an axe. They differ in their ability to cause mayhem, but are also required to bypass specific obstacles: the hammer to smash crates, rubble to chuck at distant enemies and the axe to chop through doors. 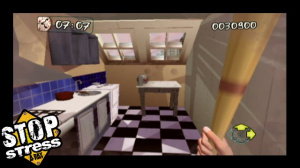 The controls are a bit unusual, but they work pretty well: the Remote is for bashing things with both vertical and side-to-side sweeps being detected well and acted out on screen as you'd expect. MotionPlus support would have made for more accurate movements, but there's no precision required here beyond vertical axe swings to chop doors or horizontal swings of anything to sweep things off countertops. Once you get the rubble bag you can chuck bricks and rocks at enemies by holding or until your current weapon is replaced with a cursor and then simply flick your wrist. The Nunchuk is used to look around you and to aim when throwing rubble (the aiming is a bit clunky, but the game helps with auto-targeting after you throw a few missiles in the direction of your quarry). and left and right on the are used to duck and dodge when facing off against enemies; you'll also need to crouch to hit the ones on the ground. Lastly is used to cycle through your arsenal of bashing instruments. Progression through the stages is via the . You press up to move to an illuminated hotspot and an icon in the lower right will have glowing arrows showing you which directions you can go in. Levels are timed and each one has a specific goal in terms of objects that need to be destroyed after which you face off against a final boss before moving to the next stage. The main things you need to concern yourself with are finding your target objects within the time limit and not getting too stressed. Enemy attacks and hidden items like dynamite and time bombs will cause crazy-man's heart meter to fill with red; if it maxes out you'll faint and have to rest. You can either end the game at this point or continue, but you'll lose all your points (not that this seems all that important since there's no leaderboards in sight). In order to help lower your stress you need to keep smashing background objects. 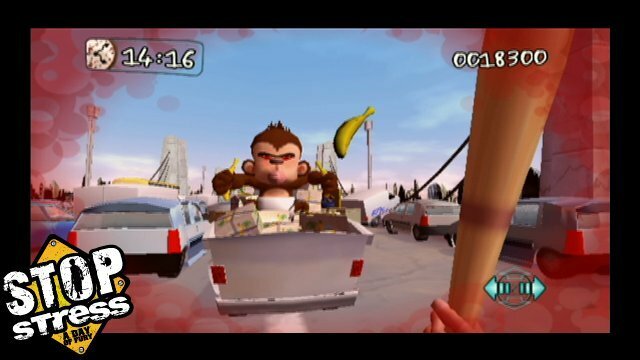 In the first stage the therapeutic smashing will actually lower your stress levels, but later on it doesn't seem to have any effect. Fortunately bonus items like herbal teas and Buddha statues appear which will lower your stress (although it's a bit odd that you need to smash them to get the desired calming effect) as well as hourglasses to increase the time on the clock. As noted there are bad items like dynamite and time bombs as well as sardine tins which release angry flies, so looking before whaling away at bonus items is recommended. The extreme stress levels (and general case of bonker-itis) our hero is suffering from cause him to hallucinate that various creatures and household objects are out to get him. You'll find giant cockroaches, giant flies, zombie policemen, evil rats and giant spiders amongst other enemies trying to break his mind. When an enemy appears you're not able to run away, but can only change facing and dodge attacks. You'll know an enemy is about because the edges of the screen will go red - though if it's something on the ground you'll need to crouch when turning about in order to find them. The game has a pretty good concept and can be pretty fun, but it has a few problems which are largely down to the control scheme and the pacing and length of the game. As expected waving the Wii Remote around does put stress on your shoulder joints and your forearm, but this game simply wouldn't have been interesting any other way. The pacing of the game and the form of the attacks means that there's simply not much time to rest: you can play through the stages in under an hour. After completing all four stages you're forced to sit through the end credits as a form of relaxation therapy - which you're going to need since you'll feel like you've been playing Wii Sports tennis all day! You have a score, but without leaderboards there's not much incentive for replays beyond the desire to smash stuff up again at higher difficulty levels, though that is fun. It also has to be said that whilst smashing things is nice, the smashing isn't quite as satisfying as it could have been. Taking a baseball bat to a bookshelf is more like using a feather duster on it: you can vertically bash away and try to make the shelves come down, but the shelves don't actually break into bits and the books fall over like well-behaved dominoes. Smaller items are satisfyingly pulverised and smashing car windows, whacking phone boxes and water coolers or chopping through doors like Jack Nicholson in The Shining is great fun, but you cannot chop the furniture to splinters and the hi-fi just shifts a bit - disappointing really. The graphics are pretty decent for a first-person action WiiWare title with some rather inventive bosses on display who are fun to fight and great MAD magazine-style hand-drawn cut scenes. Audio on the whole is pretty good, with the volume of targeted objects increasing as you get near to them in lieu of any kind of on-screen indicator, which we found refreshing. The mad laughter from your avatar after destroying targeted items or clobbering baddies is also a great touch that nicely complements the action. Stop Stress feeds the player's innate desire to smash things by using motion controls to do the smashing, though everything isn't as much fun to smash as it could have been. Because of the demanding objective to smash everything Stop Stress also stresses your arm joints; so much so that anything longer than a single play session would probably be ill-advised on health and safety grounds! Having said that there's enough fun in the game that many will find it worthwhile - assuming they can get past the 800-point asking price for a game that will take less than an hour to play through. So it's a good game but too expensive 'eh? I thought for a minute this game was never going to be reviewed. It got just what it deserved. for some reason, i expected this to be a minigame collection... which probably would have made it a buy for me, since i think that's where all these minigame collections belong. 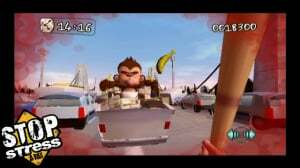 WiiWare... not Wii retail. You could play this game in real life if you didn't wear your wriststrap. Anyways, probably a pass for me. Nice review Sean. I can't say I'm surprised by the score. I was actually expecting it to do worse. 800 points for only about an hour of gameplay? No thanks. Eh, kinda was expecting this score, so this doesn't amaze me to much. Might try a demo of it if they do one, but doesn't look like I'll be buying it (should it turn up in Blighty, that is). Reminds me though, I'd like to see a new Elebits/Eledees game that fixes the originals flaws; Trashing your bedroom was great fun. Only an hour, forget it then. Smashing........no game will ever compare to the joy of the real thing. Well, it's not too expensive if this is your thing. It is a fun game, but it could have been more fun. I don't think length is a huge issue (if it was longer my shoulder would still be hurting tonight), but it's something you need to be aware of. Mostly I would have liked more spectacular smashing more destroyable furniture and an additional style of play to help ease the joint stress! Yeah, I really liked Elebits and it satisfied some of this kind of thing, while being a lot longer. It just slowed down so much once things really got messy. I wish they'd give us proper sequel to that one. Anyone who likes the sound of this one but wants more length should try Elebits, since it's probably as cheap now, and it got an unfair bad rap then. I don't know, the review makes it sound awesome! I was surprised it got the review it did. Good job, Sean. I expected more criticism given certain elements in the game. Yeah people should just get elebits, it's pretty good as long as you don't pay to much for it. well, there was the fact that we didn't really know about this game that long before it came out. At least I didn't. 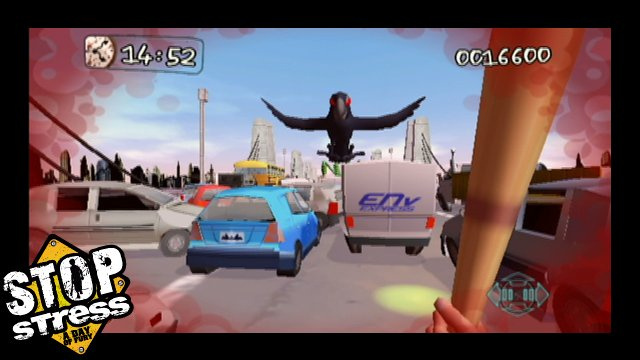 I'm sure more decent first-person games will come out soon on Wiiware. ...could've been better... and maybe cheaper. If they had a Demo version of the first level, that would probably be enough to stop my stress. could someone just explain to me what the picture on the banner is? I have to say I had some frustration related to playing some recent WiiWare titles for review and I found this game quite therapeutic. I'd love to see a beefed-up sequel; preferably where you can bang developers on the noggin!